Aside from the other benefits of having a fence, vinyl fencing in particular provides some of its own benefits. There are so many reasons to choose vinyl fencing. Whether you need a fence for privacy, safety, security, or just to get some shade, it’s easy to find a vinyl fence you’ll love. Aside from the other benefits of having a fence, vinyl fencing in particular provides some of its own benefits. The ultra-durable material that makes up vinyl fencing is called polyvinyl chloride, or PVC. It will last and last for years to come without breaking down. Unlike more traditional wood fencing, vinyl fencing doesn’t need to be re-finished or have pieces replaced every year. Vinyl fencing is extremely easy to clean. All you need to do is grab your regular garden hose and spray it down. If your fence happens to have dirt stuck on it, that usually comes off easily with some soap and water. Should you spot any mildew on your fence, simply add a splash of bleach to your soapy water! PVC is not porous, so moisture won’t be able to get in at all. This means that it can’t rot. 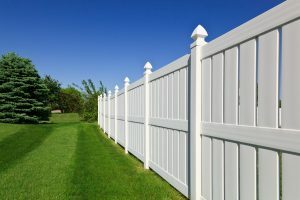 Other types of fencing will degrade over time. Wood rots easily and metals can rust but vinyl will stay strong. Bugs can’t infest vinyl fencing. Carpenter ants and carpenter bees can’t burrow in, and termites can’t eat it. Insects just can’t damage the PVC vinyl fencing material. Since vinyl fencing is so sturdy and durable, most reputable retailers have very long warranties for them. This makes it even more cost effective in the long run. Exact details of these vary by manufacturer. No matter what the color and style of your home is, there will probably be a vinyl fence that will match it. Functional, decorative, or both, vinyl fencing is extremely versatile. Even as it ages, vinyl fencing keeps its appearance. This will add style an curb appeal to your home, which is especially great if you plan on selling. This entry was posted on Friday, July 21st, 2017 at 12:24 pm. Both comments and pings are currently closed.